Summary: Princess Eadlyn has grown up hearing endless stories about how her mother and father met. Twenty years ago, America Singer entered the Selection and won the heart of Prince Maxon - and they lived happily ever after. Eadlyn has always found their fairytale romantic, but she has no interest in trying to repeat it. If it were up to her, she'd put off marriage for as long as possible. But a princess's life is never entirely her own, and Eadlyn can't escape her own Selection - no matter how fervently she protests. Eadlyn doesn't expect her story to end in romance. But as the competition begins, one entry may just capture Eadlyn's heart, showing her all the possibilities that lie in front of her . . . and proving that finding her own happily ever after isn't as impossible as she's always thought. -HarperTeen, 2015. With the original trilogy described as Hunger Games meets "The Bachelor" Cass's fourth book in the Selection series brings to mind a season of the "Bachelorette" - and a bit of a lackluster one too. Eadlyn is the daughter of America and Maxon. She is destined to become queen and only because she beat her twin brother out of the birth canal by seven minutes - a fact she likes to remind herself of often. Due to unrest in her kingdom, Eadlyn is asked to hold her own Selection and she does so, if only to help her father. But will the headstrong princess survive the ordeal without finding a husband? Or will the future queen find a ring on her finger at the end of the allotted time? I must confess, I was excited to read this book, if only because I enjoyed the Selection so much. However, like most sequels of anything, I don't think this was as good as the original series. While I understand that the book is meant to be focused on Eadlyn as she comes into her own, not a lot really happens. The Selection only starts a quarter of the way into the book and even after that, there's very little focus on it. This is due, in no small part, to Eadlyn herself and her desire to end it as soon as possible. It gets to a point though, where the reader is asking where all of the action is. Since the story is told through Eadlyn's point of view, the reader is stuck in her head. There's a lot of telling and hardly any showing; I understand that this is partly because of the nature of first person narratives, but Cass didn't show much in her writing as much as she told. While teens and some young adults might enjoy Eadlyn as a strong, feisty, and independent woman, I didn't like her that much at all. I thought she was selfish, rude, self-centered, and ungenerous. Sure, she's eighteen - still a teenager -, but not all teen royals possessed these faults to such an obvious extent. Her power phrase - "No one is more powerful than you" - really didn't sit well with me. Some might see it as self-confidence. I saw it as arrogance. She may complain that she shouldn't have beaten her brother out of the womb, but she sure is owning every second of it. The boys themselves, save for three exceptions, are so forgettable that I've had to look back in the book to see who exactly she's talking about. Hopefully, I'll remember them better in the next book. As far as the plot is concerned, there's really very little. By the time it finally gets going, the book is over. It's good to know that the next book might be starting off with some action. However, some might not want to wait that long. 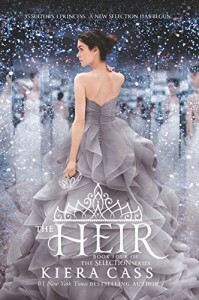 Overall, I think The Heir tries at once to both satisfy hungry Selection readers with nostalgia while making it a unique story on its own. I think it didn't do either very well. I give The Heir a B-.